The Stormwater Credit Program has been designed to provide a stormwater charge reduction to multi-residential and non-residential properties whose stormwater practices or measures provide a direct benefit to the City’s Stormwater Management Program. Multi-residential and non-residential properties make up 70% of the hard surface area in the City. These sectors have the greatest opportunity for stormwater improvements and reduction. 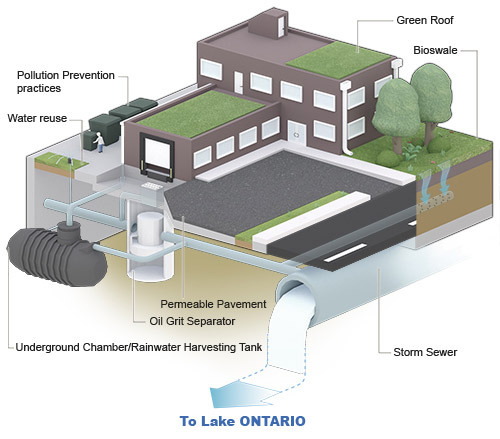 There are a number of stormwater management practices that can be implemented on multi-residential and non-residential properties as shown in the diagram below. Manage stormwater runoff rates and reduce the potential and severity of flooding on downstream land (examples include: drainage inlet controls, underground chamber systems and stormwater basins/ponds). Remove solids and other contaminants from stormwater runoff (examples include: stormwater pond, oil and grit separators and green infrastructure). Promote the reduction of the amount of stormwater runoff to the City’s stormwater system (examples include: green infrastructure, permeable pavements and rainwater harvesting systems). Prepare and implement a plan for the handling, replacement or reduced use of harmful materials created or used on a property. To be awarded credits, applicants must demonstrate through engineering reports and drawings how well existing or proposed stormwater best management practices perform, according to the evaluation criteria below. Participation in the Stormwater Credit Program is by application only. The City has prepared the Stormwater Charge Credit Application Guidance Manual to assist with the application process. Please read this technical manual before starting the application process. Supporting documents certified by a qualified professional engineer will be required as part of the application. The City may request additional documents and may conduct site inspections as part of the application review. Visit best management practices and measures for more detailed information on the type of infrastructure to consider for the Stormwater Credit Program. To attend an information session or to ask questions about the Stormwater Credit Program, please email us at: stormwater@mississauga.ca. Property owners with credits are required to submit formal update applications if changes occur that affect the performance of a best management practice. Depending on the application submission, credits can be valid for up to a maximum of five years. Credits are eligible for renewal, provided they continue to meet the required terms and conditions. A complete application for credit renewal must be received at least six months before the expiration of previously approved credits to allow sufficient time for review and approval. The City’s Stormwater Credit Policy outlines the program and process. The Stormwater Credit Program will be administered by the City’s Environmental Services Section. Stormwater Credits will appear on the Region of Peel water bill as a reduction to the Stormwater Charge amount for the property. As part of the program, the City may conduct site inspections in relation to the stormwater practices on a property. For more information, see the Credit Policy and Fees and Charges By-Law. Your personal information is collected under the authority of City of Mississauga Stormwater Fees and Charges By-law 135-15. The personal information will be used by City of Mississauga Staff to share information about the Stormwater Credit Program. Staff may also follow up with you or collect feedback. Questions about the collection of this personal information only should be directed to the Stormwater Charge Program Coordinator, 201 City Centre Drive, Suite 800, Mississauga ON L5B 2T4, 905-615-3200 ext. 4926.